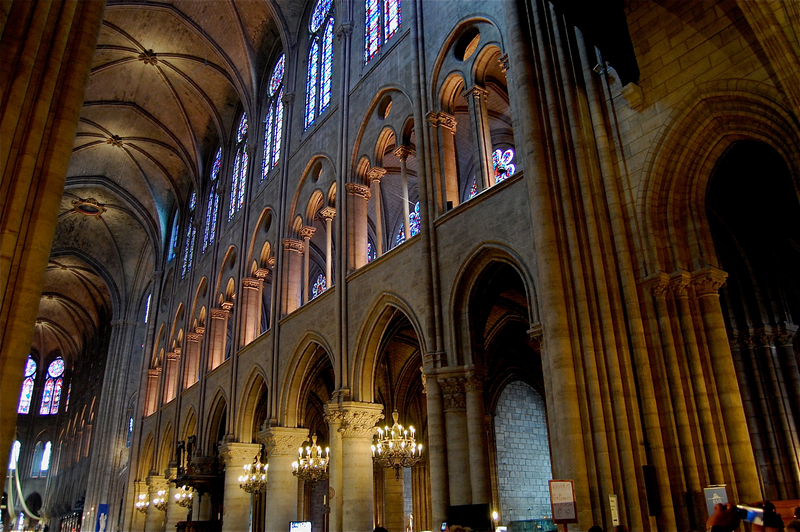 This Photo Friday image of Notre Dame is, perhaps, my favorite photo from our visit to Paris. I love the subtle blend of colors on the stonework–amber, rose and blue–created by the stained glass and candlelight. The vaulted ceiling succeeds in inspiring the worshipper with a sense of the transcendent majesty of God. Almost 700 years old and still in use as a place of worship, Notre Dame is an architectural illustration of Roman Catholic continuity and unity. Such unity is sadly absent in Protestantism, which inspired me to write this popular post: Sometimes I wish I could be Catholic. If you enjoy great photography of great cathedrals, check out this bloggers’ photos of the Chapel of the Holy Right in Budapest, Hungary. Agreed Elizabeth, and thank you for your comment. I don’t know if you read my posts on Protestant disunity or not, but I tried to make the point that modern Protestantism is suffering from many false versions of the gospel leading to disunity. Its a shame. I’d be interested in your perspective on those posts if you are interested in reading them. Thanks again.